Scribal portraits in medieval books were fairly common, and can be an important resource for scholars attempting to reconstruct the atmosphere of a medieval scriptorium, as they provide insights into the materials used in the production of the medieval book. In scribal portraits, however, there is often a substantial dose of iconographical convention mixed with attempts to make an accurate, realistic portrait. Scribal portraits may, therefore, tell us just as much about what the scribal process was thought to be like as what it actually was like. Gospels often illustrate the four Evangelists at work, and these depictions commonly show the principal elements of the scribal process. In fact, such depictions were not limited to the pages of the book, but could be found in other media – as in the case of these ivory plaques. 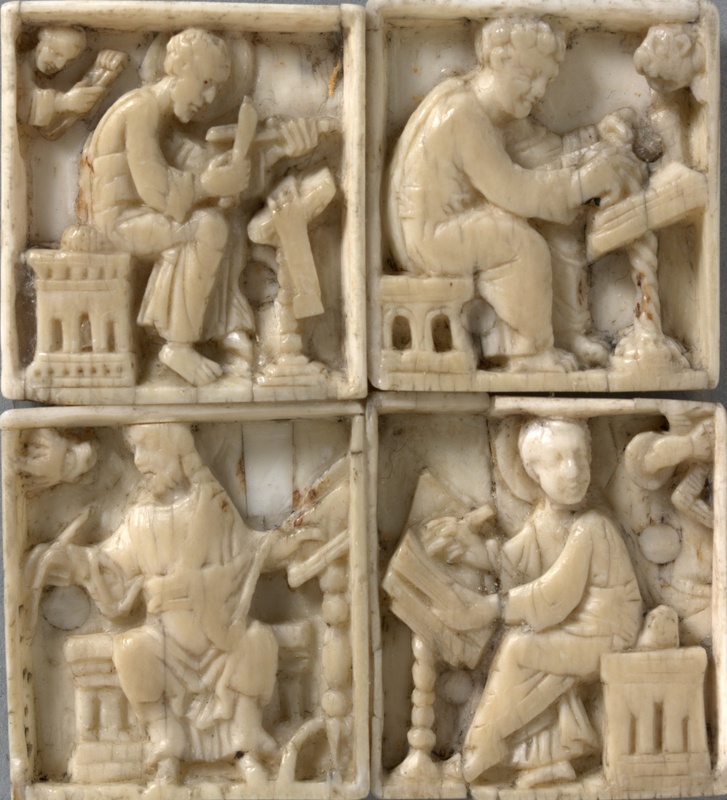 Here the Evangelists (identified in each case by their associated animal shown in the upper corner of each image) are depicted mid-process: on the top left, Matthew sharpens his quill; the next image to the right shows Luke hard at work in the process of composition; the image on the bottom left shows the Mark reaching away with his quill from the book, perhaps to refresh the ink; the fourth presents John deep in contemplation, looking beyond the boundaries of the image. Mental composition, preparation of materials, and writing are recognised as distinct stages of the scribal process. A common inaccuracy in scribal portraits, as seen in the ivory book cover, is the convention of showing the scribe writing directly into a bound volume. We know that medieval books were, instead, written page-by-page, then assembled into a book after completion; drafts were usually made on wax tablets or parchment scraps. The presentation of the scribe writing into a book, therefore, was misleading. However, it clearly shows the value that was placed on the ‘finished product’ and, indeed, on the scribe’s role in designing and executing the volume. 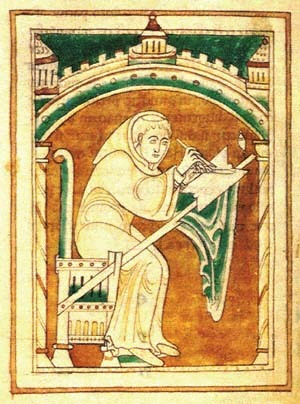 The famous portrait of Eadwine, scribe, found in the Eadwine Psalter (depicted above) is an example of this convention, and can be contrasted with the more accurate image below of Laurence of Durham, who is shown writing into a quire of parchment. Image of Lawrence of Durham, Durham, University Library. Ms. Cosin V.III. 1. f. 22v. Common tools shown in all these images include the quill and the knife. The quill was made from a hardened, dried-out feather cut at an angle. The scribe held the quill in one hand, and a knife in the other. The knife was used to sharpen the quill, to hold the parchment flat while writing, and to correct small errors by scraping the parchment. 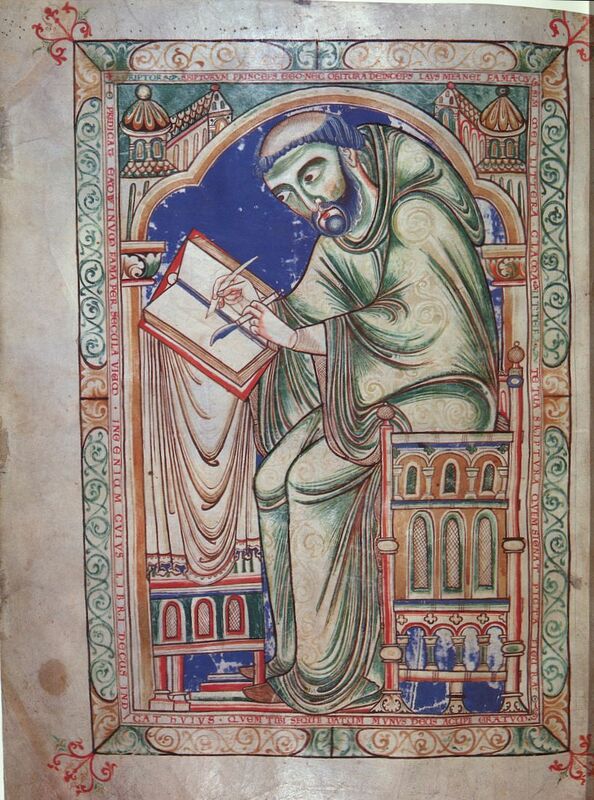 As depicted, the scribe usually sat at a sloped desk, which facilitated the flow of ink on to the page. If the scribe sat, it was at a chair with no arms, which allowed him to move physically across the page. The scribal task was often shared with that of illuminating the manuscript. 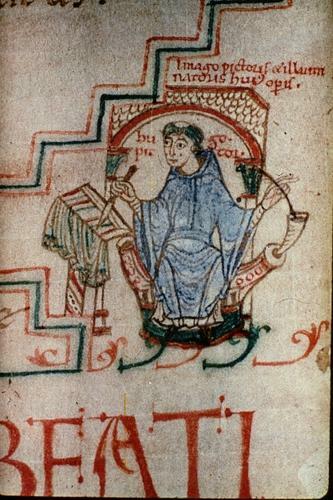 Hugh, a late eleventh-century Norman monk, who describes as ‘pictor’ and ‘illuminator’ depicts himself ambidextrously engaged in both roles – quill on parchment, feather for painting in an inkwell. of ink from green-skinned holly. penwork that cramps my hand.